Does EAS support Futures trading ? Forex Forum → Expert Advisor Studio → Does EAS support Futures trading ? Topic: Does EAS support Futures trading ? Hi, I'm new to this. Can EAS or FSBP be made to generate futures strategies ? 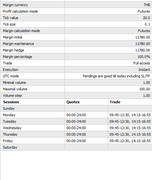 I uploaded my MT4 futures data to EAS and obtained an EA that gave very different backtest result on MT4. Re: Does EAS support Futures trading ? it´s best if you´d post screenshots comparing the backtests or even better: the JSON and MQ4 of the strategy so that Mr. Popov can investigate. I think I have to go back one step. Can anyone point me to the instructions to set up EA Studio for futures trading? Thanks. Can anyone point me to the instructions to set up EA Studio for futures trading? Export data from your broker and import it in EA Studio. Open the Generator, set a proper entry amount in lots and click Start. The future trading is no different than the Forex trading. We are not aware, if there are any specifcs in you case, but if you can trade them in MT, you can create and test expert advisors in EA Studio. You can simply follow the tutorials for the currency trading and if there is anything that bothers you may ask a specific question. Hello JLA, yes you can! I have experience using EAS with futures/exotics for real account trading. Right now we have the option "point value" in the export script for mq5 only. My suggestion for you, until we update the mq4 export script source code , is export using mt5 (if avaible in ours broker) with "data export script.mq5" script. Set it up the "Point Value" to be: 20. Appears to be your case, and import the data into EAS. Then start a "boilerplate" tradesystem with "take profit/stop loss", look into the journal to check if the point value conversion is right and match the commissions, spread and others fees. For me It will works fine. I need mt4 script. So I edited the script myself to include additional variables like so in mt5. Now I'm able to import my data. 1. my currency is THB--there is no option for that. 2. what leverage should I enter? At current price & initial margin, the leverage works out to be around 18. This is something to play around with, right? 3. On the right, are the trading session data to be matched to real ones? Hey can you share your mt4 export script? Dont know why popov didnt update it yet for mt4.